I will just quickly say that I yearn for the day that all sides of the issue can come to the table with a common attitude of respect and like-mindedness towards the goal of social equality and the intent to address human suffering. Even if we can’t agree on the priority of God’s glory, we should be able to agree on that. I’m doing an election project with one of my classes of international students (not immigrants). The students are creating their own political parties and preparing for debates. They know astonishingly little about our election. That’s not a criticism; I never really kept up with thai politics before we had that military coup. It’s just that, being election season, I was surprised that my students had never heard of john McCain. They HAD heard of Obama, but they really didn’t know anything about him. We’ve been talking a lot about the major issues, so today I had them all take a quiz at http://www.whoshouldivotefor.com. It was eye-opening for many of them. Of course, everyone expected to find out that their ideas were the same as Obama’s, and most of them did. A third of the class found out that they should vote for McCain though, and the horrified looks on their faces were priceless. One of them insisted that his result was a mistake and took the test again (with the same result). It’s just not cool to be a 20 year old college student in Seattle and not be rooting for Obama. Everyone around these kids rails against republicans so much that it’s probably easy to get the idea that all republicans are evil. Politics is so much more complicated than people make it sound. Today I discovered a really great place to eat lunch, and it’s at my school. Seattle central has a culinary school. The students serve their creations every day in their restaurant near the cafeteria. Every Friday they have a buffet with all of their weekly specials. You buy tickets (10 tickets for $5). Each dish requires a certain number of tickets. Today I had some cod with a lemon viniagette, a salad, and tirimisu. It was great! The most expensive photos ever! Saturday night Emily and I had just settled down into bed when a familiar sound met our ears – the sounds of a cat retching. Darwin had plopped down onto the floor and proceeded to empty her stomach all over the floor. We made the requisite sympathetic noises, mopped up the mess, and went back to bed. An hour later, we were woken by a repeat performance. This time, she didn’t make it off the bed before she started making the groady noises. I’m not sure if I’ve ever woken up and moved so quickly in my life! Grabbing her gently, I put her on the floor, though this time it was a non-event. Later that night, we were woken yet again to the sounds of a sick cat. This time, we were so tired that we didn’t even get up, figuring that we could deal with it in the morning. Finally she settled down, and we were able to sleep the rest of the night. Sadly, the respite wasn’t permanent. The next morning, she threw up two more times. Enough was enough, we packed up the cat and took her to an emergency clinic. 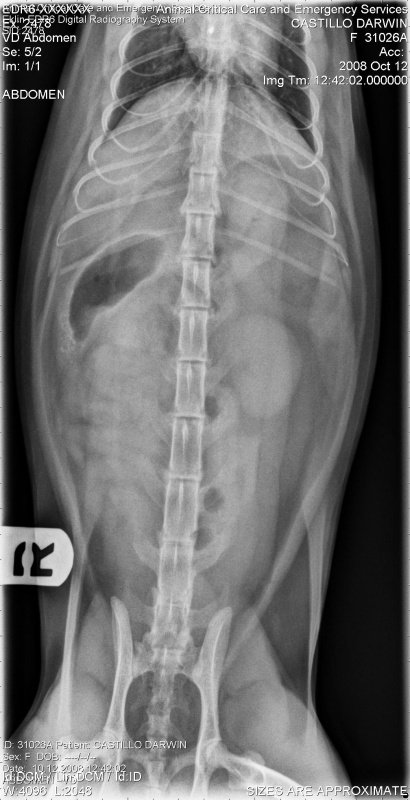 After poking and prodding her a bit, the Dr decided that we should get an x-ray, just to make sure she hadn’t ingested anything bad so we left the cat and grabbed some lunch. 20 minutes later we stood, staring at these pictures, freaking out about the dark spots. As it turned out, they represent normal gastric processes, but for a while, we thought she had swallowed a fish or something! (the related question “where did she get a little fish from” didn’t seem as relevant at the time) As it turns out, there was nothing there. 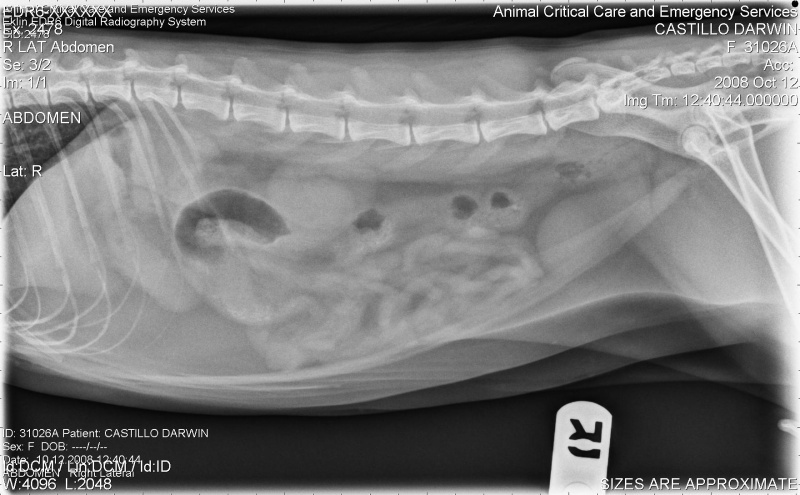 So…in the end, we had one night of lost sleep, church skipped, a panicked run to the vet, x-ray photos, subcutaneous hydration (replete with leaking…eww) , antacids, and anti-nausea injection. All for the low, low price of $300!